The Nordic Lines wool rug is inspired by all things Scandinavian and aims for a style of well-defined lines and fashionable colors, ideal for a modern, visually light and elegant look. A rectangular rug made from the finest quality wool on a base of 100% cotton. Various lines create rectangular shapes and emerge outwards, turning into braids. Manufactured by craftspeople using the ""Hand Tufting"" technique and natural dyes, it is ideal for the living room, dining room, bedroom and also for children's rooms. 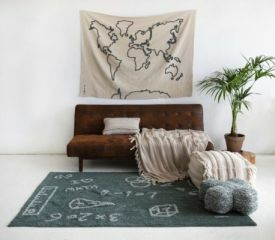 Woolen rugs are more rigid and thicker than cotton rugs and are gaining ground in the international trends of decoration.